As we still recover from the biggest show in British Wrestling history, the wrestling machine just keeps on rolling with another packed weekend coming up. Let's get Ready For The Weekend! On Friday night, Discovery Wrestling are back in action in Edinburgh, this time at the Thomas Morton Hall. 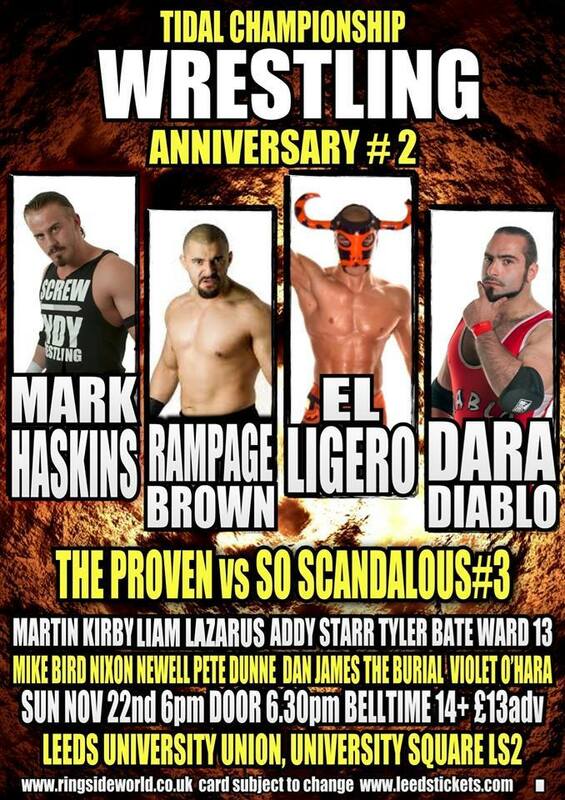 One match set to take place will see probably the most well-known man in British Wrestling today, Grado in action. Grado has had an issue with 'Global Hero' Joe Hendry ever since he cost Grado a match against Lou King Sharp. Now Grado gets his chance at retribution against Joe Hendry hopefully without any interference from Lou King Sharp. New faces are appearing in Discover Wrestling all the time and this Saturday shall be no different as 'White Lightning' Mark Andrews makes his debut. However, Andrews will not have an easy introduction to Discovery Wrestling as he faces 'Iron Man' Joe Coffey. Mark Andrews is a phenomenal athlete and will no doubt put on a show this Friday but his opponent, Joe Coffey is undefeated in Discovery Wrestling. An undefeated streak is an accomplishment in itself but Joe Coffey has defeated a plethora of international talent in Discovery Wrestling. Andrews face a great challenge but a win would be an amazing start to his Discovery Wrestling career. 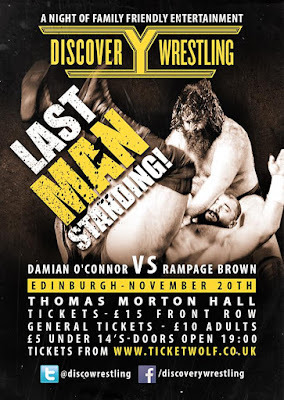 The main event this Friday shall see Rampage Brown and Damian O'Connor meet one last time. Both men hold a victory over the other in Discovery Wrestling. Neither man will back down from the other so they will now face each other until one of them cannot stand. The winner of this war will literally be the Last Man Standing. opponents. But all of his defences so far have been straight up one on one affairs. Now Chris Renfrew must defend against former N7 Champion, Lewis Girvan, a mystery opponent and a man who has been in pursuit of Chris Renfrew for a number of months, DCT. Renfrew is a champion who will use the numbers game when needed. The tables are now turned though as the champion has a numerical disadvantage. Anyone could win this Saturday, who it will eventually be is very much like the fourth competitor, a mystery. The main event for November 21st will see 'The Beast Of Belfast' Big Damo defend the Pride Heavyweight Championship against Mikey Whiplash. This match will mark Big Damo's first defence of the heavyweight championship and the first appearance of Mikey Whiplash since he was robbed of the championship by Jacke Polo mere moments after winning it. Big Damo is the biggest man to ever hold the Pride Heavyweight Championship and will look to start his reign off with a showcase of his dominance. Mikey Whiplash will be looking to right the wrong that done to him earlier this year. One man is looking to start his reign as he means to go on. The other looking to start a reign he was so cruelly denied. 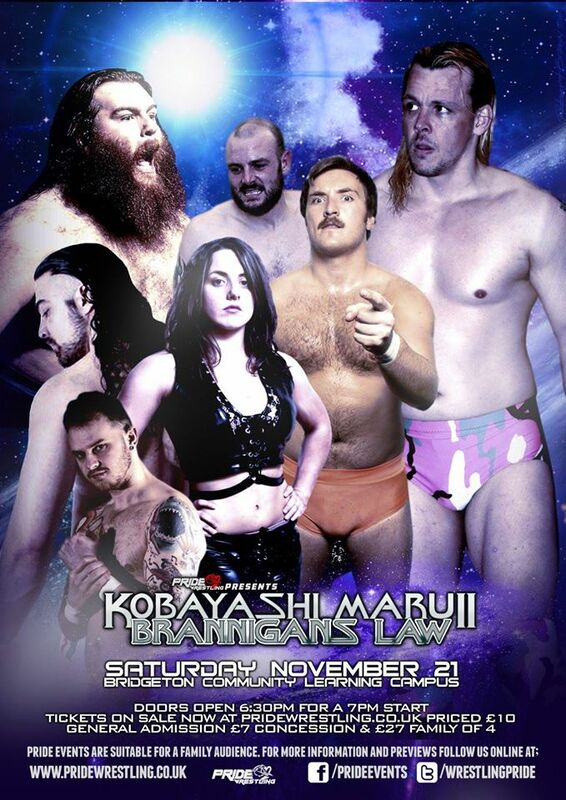 DCT vs Chris Renfrew (c) vs Lewis Girvan vs ??? Finally on Sunday, Tidal Championship Wrestling will celebrate their second anniversary at the University Union in Leeds. They are not doing things small either as they have a nine match card set to take place! The main event will see Dara Diablo defend the TCW Championship for the first time since his win. He defends the title against a man who he knows very well, 'The Mexican Sensation' El Ligero. While Diablo may not pinned the champion to win the title, his accomplishment is still a big one. His defence will be even bigger as El Ligero is some of the toughest competition he could face in Tidal Championship Wrestling. From one championship to another, namely the TCW Open Championship. A few months ago, Sean Only had to forfeith the championship after substaining an injury that prevented him from competing. So now we need to have a match to find a new champion. Step up Violet O'Hara and Dan James. These two have met before in the past during the tournament to crown the first TCW Open Champion. We are guaranteed a new champion this Sunday so let's see who of the two that tried to capture the gold the first time can capitalise when opportunity presents itself once more. When people talk about the best in the UK, Martin Kirby is always in the mix. Another man often mentioned is Mark Haskins. If we discuss young rising talent, then former TCW Champion, Liam Lazarus is near the top of the pile. So in Leeds we're going to see two of the best in British Wrestling and a former champion and rising star compete in a triple threat match. This match should be all kinds of great. If you want to celebrate an anniversary then there really is no better way to do it than to have these three men compete in one ring.